I used to always seek out as much information about a film before seeing it, under the mindset that prior knowledge would lead to a better comprehension during the experience and thus a more rewarding one. Lately I have been doing the opposite, knowing nothing but the title at the moment I pressed play and I gotta tell you, comprehension is overrated. I could get used to this. 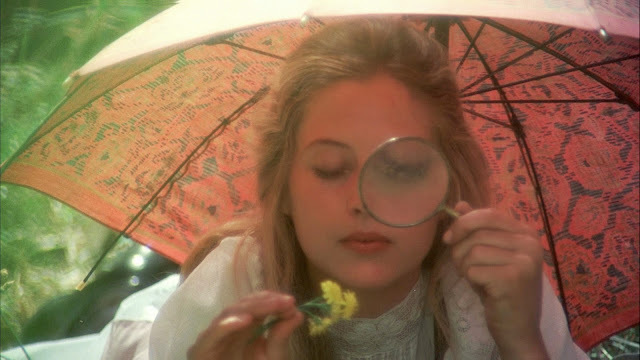 Picnic at Hanging Rock, a film from 1975 by director Peter Weir, is one that seems to defy any hope of comprehension upon a debut viewing. If you were able to watch this only once and claim to know exactly what was happening at all times, claim to have a complete understand of its thematic significance, I actually don't envy you, I feel sorry for you. The befuddled feeling I had as the story moved towards its conclusion was oddly exciting and instead of feeling like I had completed a journey when it finished, ironically I know I have only just begun. The year is 1900 and on Valentine's Day, a group of female students and their teachers decide to go on a picnic at a location known as Hanging Rock, but not everyone returns back to the school when some of the girls and a teacher of theirs seem to completely vanish and no one knows how or why. The film almost feels like a dream, a surreal experience that is difficult to put into words, a lyrical and brilliantly crafted picture that almost certainly will get better with age and revisits. One part horror, another part mystery, an alluring mysticism and seemingly a whole lot of sexual repression. The recipe that created Picnic at Hanging Rock.